This evening Dave and I spent quite a while clearing out amaranth (pigweed) that's been growing up near the house. We'd been wondering about it for quite some time. It's quite an attractive plant when small, with pretty patterns on its leaves that remind me of some of the decorative houseplants we used to try to grow when I was a kid. I've been working on an Invasive Plants page for the nature center, partly as a way to figure out myself which plants we need to pull and which are okay. For instance, Russian thistle (tumbleweed) -- everybody knows what it looks like when it's a dried-up tumbleweed, but by then it's too late, scattering its seeds all over. Besides, it's covered with spikes by then. The trick is to recognize and pull it when it's young, and the same is true of a lot of invasives, especially the ones with spiky seeds that stick to you, like stickseed and caltrops (goatheads). 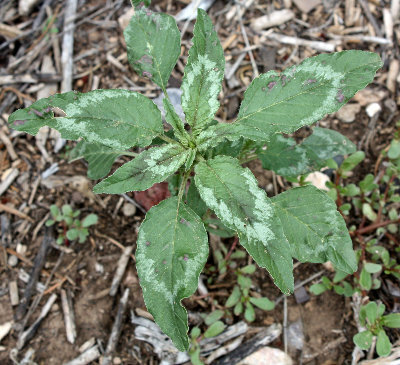 A couple of the nature center experts have been sending me lists of invasive plants I should be sure to include, and one of them was a plant called redroot pigweed. I'd never heard of it, so I looked it up -- and it looked an awful lot like our mystery plant. A little more web searching on Amaranthus images eventually led me to Palmer's amaranth, which turns out to be aggressive and highly competitive, with sticky seeds. Unfortunately the pretty little plants had had a month to grow by the time we realized the problem, and some of them had trunks an inch and a half across, so we had to go after them with a machete and a hand axe. But we got most of them cleared. As we returned from dumping the last load of pigweed, a little after 8 pm, the light was fading, and we were greeted by a bat making rounds between our patio and the area outside the den. I stopped what I was doing and watched, entranced, as the bat darted into the dark den area then back out, followed a slalom course through the junipers, buzzed past my head and the out to make a sweep across the patio ... then back, around the tight corner and back to the den, over and over. I stood watching for twenty minutes, with the bat sometimes passing within a foot of my head. (yay, bat -- eat some of these little gnats that keep whining by my ears and eyes!) It flew with spectacular maneuverability and grace, unsurpassed by anything save perhaps a hummingbird, changing direction constantly but always smoothly. I was reminded of the way a sea lion darts around underwater while it's hunting, except the bat is so much smaller, able to turn in so little space ... and of course maneuvering in the air, and in the dark, makes it all the more impressive. I couldn't hear the bat's calls at all. Years ago, waiting for dusk at star parties on Fremont Peak, I used to hear the bats clearly. Are the bats here higher pitched than those California bats? Or am I just losing high frequencies as I get older? Maybe a combination of both. Finally, a second bat, a little smaller than the first, appeared over the patio and both bats disappeared into the junipers. Of course I couldn't see either one well enough to tell whether the second bat was smaller because it was a different species, or a different gender of the same species. In Myotis bats, apparently the females are significantly larger than the males, so perhaps my first bat was a female Myotis and the male came to join her. The two bats didn't reappear, and I reluctantly came inside. Where are they roosting? In the trees? Or is it possible that one of them is using my bluebird house? I'm not going to check and risk disturbing anyone who might be roosting there. I don't know if it's the same little brown bat I saw last week on the front porch, but it seems like a reasonable guess. I've wondered how many bats there are flying around here, and how late they fly. I see them at dusk, but of course there's no reason to think they stop at dusk just because we're no longer able to see them. Perhaps I'll find out: I ordered parts for an Arduino-driven bat detector a few weeks ago, and they've been sitting on my desk waiting for me to find time to solder them together. I hope I find the time before summer ends and the bats fly off wherever they go in winter.